Mold can be found nearly everywhere in nature. It exists in the air outside and sometimes inside of buildings. More often than we realize, our body is under bombardment by invading fungi. Mold Allergies – See the section below titled “Mold Allergies”. Weak or Undeveloped Immune System – Some immune systems are weaker due to genetics, life experience, disease or medical treatment. Exposure to High Concentrations of Mold – This can be in an indoor or outdoor environment. 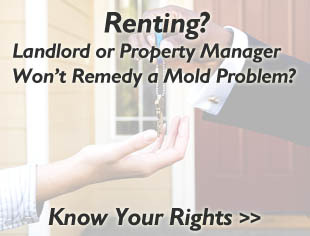 Exposure to Toxic Mold – See the section below titled “Toxigenic Mold (Toxic Mold)”. Typically, mold is known for its impact on the respiratory sytsem of the body. While this is true in most cases, there are other ways that mold can enter the body besides through the inhalation of airborne mold spores into the sinus tract, esophagus, lungs or other parts of the respiratory system. Not washing hands after handling moldy materials and touching the eyes, nose or mouth. When a typical person breathes in any type of mold, their body initiates an immune response, sending out cells to attack and destroy the spores. However, if you have a mold allergy, the immune system overreacts and triggers a cascade of reactions that leads to an allergic response. Some substances that are released, such as histamine, are responsible for the irritating symptoms experienced by those with allergies. An allergic reaction can result from contact with the mold, or from the byproducts it produces, such as volatile organic compounds (VOCs) or mycotoxins. Not all molds cause allergies, and if you are allergic to one type of mold, you may not necessarily be allergic to another. The most common types of molds that cause allergies are Alternaria, aspergillus, Cladosporium, and Penicillium. While no one is immune from developing an allergy to mold, there are several risk factors involved in developing a chronic reaction. For example, people who have a family history of allergies are more likely to develop a mold allergy. The symptoms experienced are similar to that of hay-fever (sneezing, coughing, itchy eyes, etc.) and are typically mild, unless coupled with underlying asthma or other lung conditions. Chronic exposure to mold can result in hypersensitivity pneumonitis (inflammation of the lungs). Illnesses caused by indoor molds, known as mycoses, are typically opportunistic; they normally will not affect a healthy individual and only cause disease in a person who has a compromised immune system. This failure of immunity can occur by disease, such as HIV/AIDS, or by taking immunosuppressant drugs following a solid organ transplant. Pathogenic effects are also seen in persons with an underlying chronic lung condition, such as asthma or cystic fibrosis, as well as in cancer patients receiving prolonged chemotherapy. When pathogenic fungal spores are inhaled by an immunocompromised individual, the fungus begins to grow within the lungs and can disseminate, or spread, to various other organs and tissues via the blood stream. Diseases such as invasive aspergillosis develop in this way, often causing fatality due to its rapid progression throughout the body. Disease can also occur through direct inoculation through skin contact with pathogenic fungi, but the primary origin of entry for most mycoses is through the pulmonary tract. Symptoms vary depending on the pathogenic species and area of infection, but generally include: fever, cough, shortness of breath, chest or joint paint, nosebleeds, facial swelling on one side, and skin lesions. Some indoor molds have the ability to produce mycotoxins, which are toxic byproducts produced during metabolism. Symptoms caused by mycotoxins vary depending on the type, amount, and duration of exposure. Mycotoxicoses can result in acute toxicity, causing a rapid onset and obvious symptoms of toxic response, or chronic toxicity, caused by low dose exposure over a long period of time, typically resulting in cancers and other irreversible effects. In either scenario, the mycotoxins can enter the body via ingestion, skin contact, or inhalation. Generally speaking, symptoms of mycotoxicosis include dermatitis, recurring flu-like symptoms (sore throat, headaches and fatigue), diarrhea, and impaired immune system function, which leads to an increased risk of developing other infections. Over the years, there has been a lot of suggestion that mycotoxin producing molds, such as Stachybotrys chartarum, are linked to chronic inflammation of the lungs in adults and children, as well as pulmonary hemorrhage in infants and Sudden Infant Death Syndrome (SIDS). There is also speculation that exposure to certain indoor molds can lead to damage of the liver or central nervous system and can cause cancer. Any of the above should bring about concern with property owners or occupants as they can be an indicator of an indoor mold problem. Unfortunately, while these conditions should warrant a reaction, many people don’t react until their health or the health of someone they know is impacted. Despite the indicators, addressing a potential mold problem is important. The first step in this process is to verify whether or not you actually have a problem and, if one is present, the size of the problem. Several environmental inspection companies are available to investigate a property to determine if a harmful mold growth and environmental contamination exists. During the property inspection, samples of the air and surfaces are taken during the mold testing process. These samples should then be analyzed by an independent third party lab to detect the presence or absence of mold growth within the area in question. If the investigation of the property concludes that the indoor environment is unsafe, mold remediation should be pursued. It is not recommended that mold be remediated by a private party, regular contractor, or maintenance worker as this can exacerbate the problem. The best choice for mold remediation is a professional mold remediation or damage restoration company that is experienced and certified in environmental remediation and decontamination. 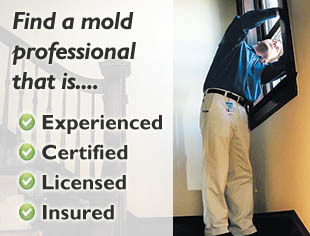 Finding a Company That Addresses Mold: If you have decided that you would like to seek out a mold company to conduct an inspection to determine if you have a problem, find a certified company in your area here. Dr. Phillip Blanchett is a licensed physician who specializes in Pulmonology and Otolaryngology. Born in Brooklyn, New York, Dr. Blanchett graduated from Cornell University and attended Weill Cornell Medical College. His graduate and post-graduate studies were completed at University of California, Davis. He completed his residency at the St. Francis Memorial Hospital in San Francisco. Currently, he lives in the San Francisco where he researches respiratory and pulmonary illnesses at UCSF. New information about mold, indoor air quality, and how these subjects impact our health and lives is constantly being researched. Enter your email address below to receive the latest updates.